"The programme is useful not only for new entrepreneurs but also for us experienced entrepreneurs to get fresh views on our enterprise create business relations and potential partnerships”. Claudio Di Patria, a 30-year old would-be entrepreneur wanted to set up his own business of "Made in Italy” products in Hungary. He felt confident about the idea thanks to his extensive professional experience in the sector and knowledge of the Hungarian market. However, his competences of managing a business were inadequate; he notably had insufficient understanding of the business mechanisms and needed a real-life managerial experience before taking the final step. Erasmus for Young Entrepreneurs seemed the perfect solution for him! Motivated and self-confident about the competences he could offer, Claudio undertook some researches and rapidly got in touch with Giovanni D'Angelo owner of the "Caffè Gian Mario” bar in Budapest. This 44-year old experienced entrepreneur had started his business four years earlier and needed new ideas from a specialist to develop it further. Claudio's proposal was an opportunity that he could not miss as it exactly corresponded to his company's needs. The business exchange started on 1 March 2012. Both entrepreneurs rapidly noticed that they were on the same professional wave length. 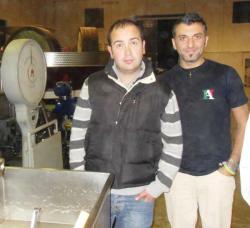 During six months, Claudio and Giovanni worked together on organising and developing the "Caffè Gian Mario”. With his expertise in communication and marketing, Claudio set out a communication plan to achieve Giovanni's goals. From his side, Giovanni devoted his time, flexibility and efforts at the disposal of Claudio, to involve him in the day-to-day operations of the company as well as in the decisions that can determine a business' future. Together Claudio and Giovanni set out a new communication plan to attract new clients and boost sales. As Claudio was directly confronted with real situations such as managing the staff the budget the stock of goods and orders relationships with customers and suppliers he could put into practice the knowledge and recommendations acquired from Giovanni and make his own experience. He now feels more familiar with the market in Hungary its demands and needs. Claudio acquired the knowledge on administration finance and management that he needed for the success of his business. He now feels more comfortable with the idea of creating his own company. Giovanni benefited from Claudio’s creative and innovative solutions which turned old problems into opportunities. The image of the "Caffè Gian Mario” bar has also been refreshed and its visibility has increased. This attracted new clients and boosted sales.